In a nod toward National Taco Day, restaurants that serve tacos often offer free and cheap tacos. Taco Bell is making a kind of weird gift box. Some places are simply making the great tacos they sling day-in and day-out. Victor Santibañez, chef de cuisine at New York's Bodega Negra, is taking a totally different approach. The creation is called ¡Taco Enorme!, and the title is apt. The $65 taco weighs a mind-boggling seven pounds, which is basically the average weight of a newborn human. 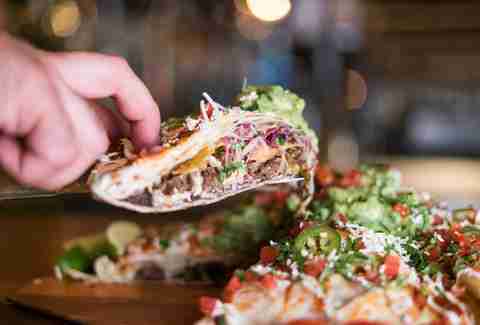 The huge taco contains 15 ingredients, including seven different kinds of cheese, wagyu beef, Mexican truffle oil, poblano peppers, and chipotle guacamole. The Enorme fits the stunt food mold familiar on national food holidays. However, it is definitely trying to raise the bar a bit with its ingredients from the usual over-the-top mold that often involves something like Flamin' Hot Cheetos or getting lobsters stoned. "We wanted to do something that veers outside traditional Mexican cuisine, but that still highlights the influence that tacos and other Mexican food traditions have had on our culture and daily lives," executive chef Brad Warner said in a statement. "The ¡Taco Enorme! 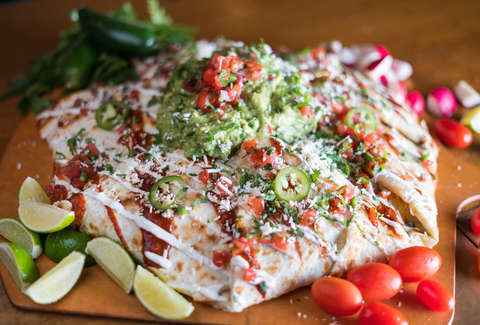 straddles that line perfectly, as it incorporates classic Mexican ingredients like queso Oaxaca, poblano peppers and Mexican truffle alongside unexpected additions like wagyu beef and gouda cheese." The creation is available to order at Bodega Negra at Dream Downtown from National Taco Day (October 4) through October 10. It's recommended for six people, but, you know, if you want it to be all yours, no one is stopping you except your ancestors who didn't evolve a series of four stomachs like a cow.